Leprosy and tuberculosis (TB) are mycobacterial diseases with remarkable social and epidemiological impact both in past and present human populations. During the last decades, relevant improvements were made on the paleopathological diagnosis of these chronic infections and, consequently, cases detected in archaeological material from different historical periods increased considerably worldwide. 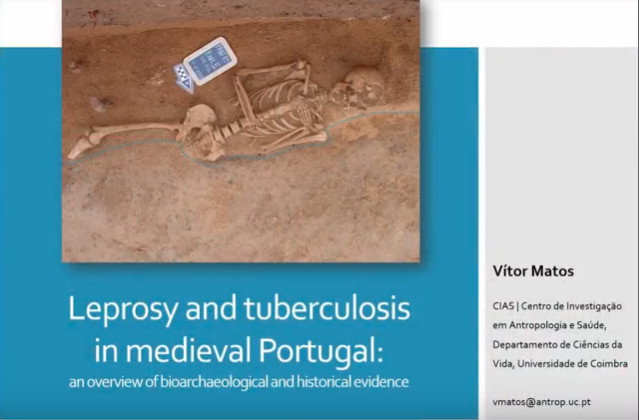 This paper will present a systematic review of skeletal evidence of leprosy and TB in medieval Portugal and, by combining bioarchaeological and historical evidence, will provide a broader picture of their historical path and coevolution. The paleopathological record reveals that the oldest possible cases of TB and leprosy in the Portuguese territory date back to the 4th-5th centuries AD. The number of cases augmented considerably after the 12th century, a trend also seen in other European countries, probably due to increased population density, mobility, and social inequalities. While TB is poorly documented on the Portuguese historical record until the 19th century, the poor living conditions and social exclusion of leprosy patients, including their isolation in leprosaria, is well documented historically.